Objective: I know how to calculate problems that involve the base, height and area of a triangle. Given any two values of the formula, we can calculate the third value. Read the lessons on area of triangle if you need to learn how to calculate the area of a triangle. 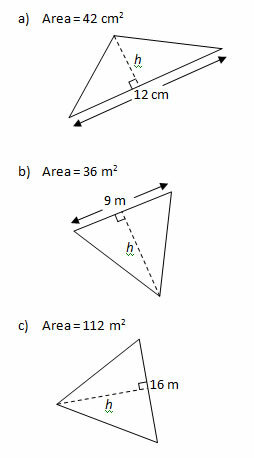 Given the areas of the following triangles, find the value of the height h.